It’s that time of year, where lots of Sonoma events have a special focus on the olive. Last Sunday, I attended the Olive Curing workshop as part of the Sonoma Valley Olive Festival. Don Landis did an amazing job talking about the History of the olive, and how to cure olives using a non-lye method. Screetch - ya, you read that correctly. Some times when olives are cured, they use lye. Yes, granted it SHOULD be food grade lye, but I’ve heard of some people house curing olives and using.. DRAINO.. Ick ick icky. Um, No thank you. 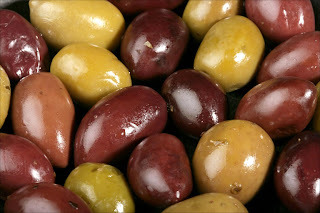 Don’s recipe is a salt brine process, that let me tell you after tasting these little beauties, you will wish that it was time to harvest the olives, cause you don’t want to wait another second to try this yourself! My point? olives! yummy wonderful olives! The Feast of the Olive Dinner, will be held on January 24th at Ramekins Culinary school in Sonoma $150 12 chef’s preparing dinner! YUM. Don Ladis will once again be doing his seminar this time at B.R. Cohn on January 25th. If you like to make home-made gifts, or have an olive tree or are an aficionado of olives, this is something not to be missed! And lastly - My friends who always come to visit me from far off places, ALWAYS always comment on how lucky I am to live in such a beautiful area as Sonoma County. My typical response is to smile and nod. Ya ya ya,, it’s beautiful here - and I go back to what ever it is that I was doing, I think we become desensitized of our surrounds when ‘life’ is happening all around us on a daily basis. Well, this morning, I was at a tasting, and man, let me tell you it was way to early to be having wine, I hadn’t even had my coffee yet - it was a cold, crisp morning - but clear and sunny. 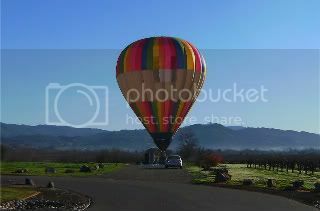 I am guessing it couldn’t have been over 40 degrees yet (which to us warm weather birds is pretty dang cold if there is daylight)… anywho, I was pulling out of my tasting and at the corner of the driveway there was a hot air balloon getting ready to launch. It’s been a while since I’ve seen one so close. Years ago as a kid, they would land in the lot next to my house. I often see them up in the air on these perfect California mornings, but rarely am I a few hundred feet away from one still on the ground, as you have to be an early bird to experience this I’m guessing, and I am more of a night owl..
My point? I don’t really have one, but here is a photo of it, because I always have my camera in my car, and try to snap those moments that make me say “wow” I really live in a cool area - just so I can keep reminding myself of that fact.